It is easy in this blog to get caught up with stories about the hustle and bustle of the Village of Lake Placid, and forget about the main reason people started coming to the Adirondacks in the first place. The Adirondack North Country of upstate New York has been a place to get away to and find physical, if not spiritual, renewal for hundreds of years. The reasons are too numerous to detail, although I keep trying. Naturally, a big part of Adirondack living involves the mountains. No one knows more about mountains than rock climbers. 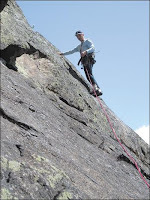 There are some great climbs in the Adirondacks and therefore some great climbers. There is an interesting article in today's Press Republican about those two things: great Adirondack rock climbs and great Adirondack rock climbers. Legendary climber Don Mellor is featured along with the legendary remote climb of Wallface Cliff in Indian Pass. Rock climbing is one of the things that attracts people to the Adirondacks. I don't completely understand it, but I know and like a lot of rock climbers. Don Mellor is one of them. He was Dean of Students and Assistant Head Master at Northwood School when my son was a student. At the risk of gushing, Don was a great influence on our family. My son received an excellent education at Northwood and was surrounded by some of the most interesting, intelligent, dedicated and solid people around. Now back to my original premise that the Adirondacks are an awesome place to renew. It must be extremely exhilarating and renewing to get to the top of a very steep cliff, still in one piece.